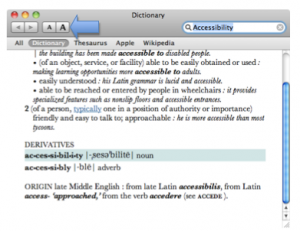 Mac OS X includes a built in dictionary and other reference tools that are always accessible while you work on a document. Click anywhere on a word you want to look up in the Dictionary and press Control, Command, D. This will bring up the Dictionary popup window. Use the menu in the lower left corner of the popup window to select the Thesaurus if you want to look up synonyms of the selected word. 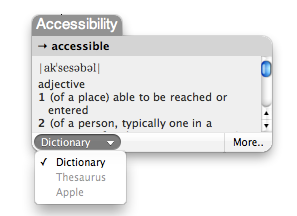 Choose More on the right side of the popup window to open the Dictionary in its own window. Use the text size buttons at the top of the window to change the text size if you have a difficult time reading it. Use the tabs at the top of the window to switch between the Dictionary, the Thesaurus (for synonyms) and Wikipedia (a free online encyclopedia). To look up a different word than the one you have selected, enter a search term in the search box at the top of the window. To close the reference tools, click the Close button (red) in the upper left corner of the window. The Dictionary can be opened as a separate program by launching it from the Applications folder on your computer.